333 West 38th Street. Rendering credit: Gene Kaufman Architects PC. Photos by the author unless indicated otherwise. Developer Optima Real Estate is planning a 21-story, 79-room hotel building on an excavated mid-block site at 333 West 38th Street. The design comes from Gene Kaufman Architects PC, known for working on a large number of similar projects around the Garment District and beyond. The building, which the architect website describes as a “boutique hotel,” would span 33,014 square feet. Of these, 28,099 square feet register as commercial space. In the 1920s, a wave of redevelopment destroyed over half of the local building stock, which consisted of multi-story tenements and low-rise commercial facilities. The high-rise buildings erected in their place generally rose between 12 and 20 stories, forming continuous, set-back canyons shaped by zoning regulations enacted a decade earlier. 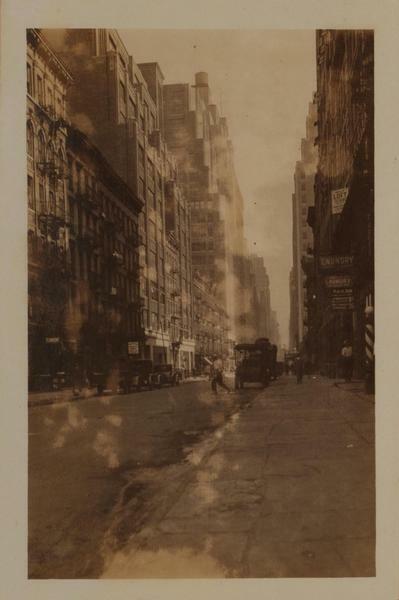 West 38th Street, looking east from Ninth Avenue. 333 West 38th Street is the second building from the left. Percy Loomis Sperr. October 1927. New York Public Library. Image ID 712505F. Local construction ground to a halt during the Great Depression, and the neighborhood’s built environment remained mostly intact until development ramped up again in the past couple decades. With the growth of the city’s tourism industry, developers saw the Garment District’s generous zoning, proximity to attractions such as Times Square, and adjacency to transit hubs such as Penn Station and the Port Authority Bus Terminal as lucrative for hotel construction. Much of new development replaces parking lots and turn-of-the-century low-rise buildings that predated the 1920s construction boom. Since 2004, 10 high-rise hotels were built on an under-developed block across from the Port Authority Bus Terminal, bound by West 39th and West 40th streets and Eighth and Ninth avenues, with two more in progress at 306 and 310 West 40th Street. In contrast, developers operating within the dense neighborhood interior frequently had to contend with limited space and challenging lots. The hotel replaces a five-story tenement, part of an architectural ensemble of which only its neighbor at 333 West 38th Street remains. The new high-rise would fill most of the narrow, approximately 2,400-square-foot site, measuring 247 feet tall and only 23 feet wide. The resulting height to width ratio of 10.6 qualifies the building as slender. Zoning diagram. Credit: the Department of Buildings. The slim structure would rise above its immediate neighbors, allowing for skyline views from the top floors and the 250 square-foot roof deck. 333 West 38th Street would rise at the center of the photo. 310 West 40th Street is under construction in the background and the New York Times Building is in the center. The construction permit indicates that the structural system would consist of cast-in-place concrete. Despite its prominent height, the design defers to its setting. The 59-foot-tall, six story base maintains the proportions of the low-rise it replaces, and matches the established street wall. The deep setback of the tower preserves view corridors to ornate, pre-war neighbors. The beige color of the austere facade references its context. The developer purchased the property for $4.6 million in 2011. Demolition took place over the course of late 2013 and early 2014. Scaffolds rose around the building last summer and the construction permit was issued in November. A stop work order, issued in April, currently prevents construction from progressing. p The proposal at 333 West 38th Street maximizes its site’s potential without compromising its historic context, and would contribute to a round-the-clock pedestrian presence in a neighborhood dominated by offices and light manufacturing.